Created by: Sy Bartlett & Beirne Lay, Jr. This show was classified a military drama and it followed the exploits both in the air and on the ground of the 918th Heavy Bombardment Group. They were stationed in England during World War II from mid-1942 through 1944. One of the more unique things about this show is the use of actual military footage of bombings of Germany and occupied territories during the war. Some of this footage is from the bombardiers vantage point and some is shot from the planes nose cameras. This mingling of vintage war footage with newer film techniques was often very obvious but added even more reality to the series. The group is commanded of Brig. 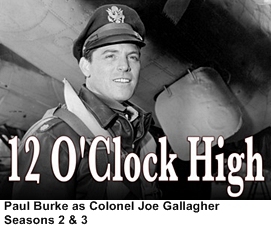 Gen. Frank Savage during the first season but changed to Col. Joseph Anson Gallagher for the second and third seasons. 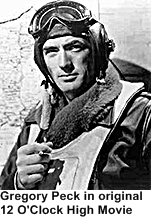 The series was entirely based on the 1949 film of the same title starring Gregory Peck as Gen. Savage. A privately owned “vintage” B-17 was used extensively in the filming of the show but because the one plane had to look like many different planes landing or taking off it was constantly being repainted. Because flying the B-17 required the studio to pay for two pilots and a small crew, in seasons 2 and 3 less and less footage of the plane actually flying was shot.